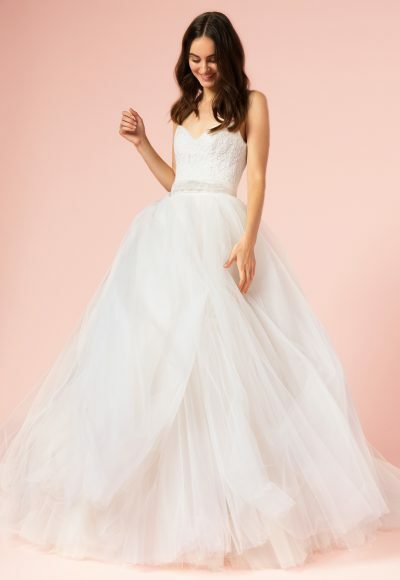 Bliss by Monique Lhuillier was envisioned by designer, Monique Lhuillier, when developing her signature style of classically feminine, yet modern and available to a broader group of women. Bliss Monique Lhuillier encompasses the distinctive characteristics for which Lhuillier is known: hand-tufting, delicate embellishment, fine laces, and impeccable fabrications in silk satin and organza. Monique Lhuillier and husband, Tom Bugbee, founded her eponymous company in 1996 by launching their first bridal collection. In 2002, the ready-to-wear and eveningwear division was launched, followed by multiple licensed categories, including footwear, tabletop, and home fragrance. Monique Lhuillier has become one of the leading innovative fashion houses in terms of design, quality and brand image. Over the course of the last decade, Monique Lhuillier’s designs have graced the wedding aisle of some of Hollywood’s most famous brides, including Reese Witherspoon and Carrie Underwood. With a passion for creating gowns that are feminine, modern and glamorous, Monique Lhuillier continues to design collections that are luxurious, chic and true to her aesthetic. Her signature design sensibility has led to the launch of licensed products, transforming the company into a luxury lifestyle brand. Licensed products include tabletop, bridesmaids dresses, stationery, home fragrance, ML Monique Lhuillier (a diffusion evening wear collection) and most recently, couture footwear and fine jewelry.